1 Clickety-clack, clickety clack: knitting is a relaxing hobby. It is one craft that has its own rhythm and where speed is not crucial. Knitters can make thoughtful, special handmade gifts. There is nothing quite like getting a five-foot, colorful knitted scarf for Christmas! 2 Knitting used to be a necessary craft for making clothing. 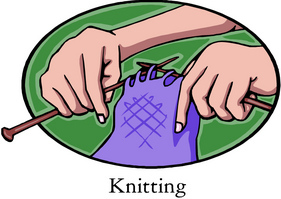 Compared to other arts and crafts, knitting has not been around a long time. Archaeologists discovered one pair of knitted socks in Egypt. These were not like the dusty old socks that hide under your bed. They dated backed to approximately 1,100 A.D. You might think that 900-year-old socks are old (they would be if they stayed under your bed that long). However, scientists think that these socks are new when they compare them to other artifacts. 3 Some historians believe that the Egyptians learned knitting from Arabian nomads. From Egypt, the craft of knitting traveled to North Africa. After that, knitting became popular in Europe. In the Middle Ages, groups called guilds controlled the market. The rich upper class liked fancy knitted silk gloves and stockings with pretty designs on them. At first, only men did knitting. Soon, it became a household activity because everyone liked to wear knitted socks. By the late 1600s, supposedly between one and two million knitted stockings were exported from Great Britain. Feedback on What Is Knitting?